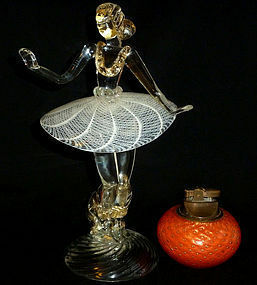 Stunning Large Murano Hand Blown Clear Body with GOLD FLECKS and White ZANFIRICO Ribbons Art Glass BALLERINA Sculpture!!! Created by the SALVIATI Company!!! The woman has a beautiful ballet dance pose, and stands on a clear base. There are also very thin aventurine threads inside the white ribbons (see last photo). It has NO damage (chips, nicks, fleabites or impact marks). In EXCELLENT Condition!!! 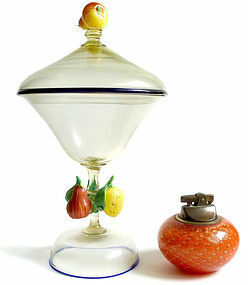 Gorgeous and Rare Early Venetian Hand Blown ORANGE and GOLD FLECKS with PINK Flowers Drinking Glass!!! Attributed to SALVIATI, circa 1900s or earlier! 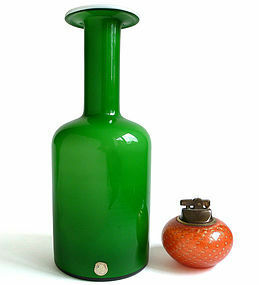 This antique piece has a quilted pattern in bright orange. Very ornate stem with flowers and green leafs attached. It has NO damage (chips, nicks, or fleabites). In EXCELLENT Condition!!! 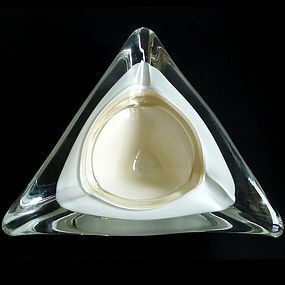 Murano Hand Blown AVENTURINE FLECKS over White Art Glass Trinket or Jewelry Dish!!! Attributed to the FRATELLI TOSO Company. 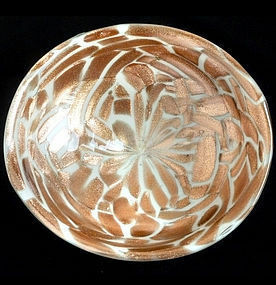 The piece is made with large pieces of aventurine, creating an exotic animal print pattern. Has a worn "Made In Italy" label underneath. Has NO damage (chips, nicks, or fleabites). It does have some tool marks on the outside. In GREAT Condition!!! 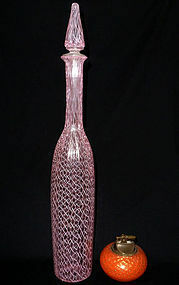 Elegant Tall Murano PINK ZANFIRICO Ribbons Art Glass DECANTER!!! Attributed to VENINI! The piece looks to have a signature underneath, but very faded. I have tried to take a photo of it (photo 5). 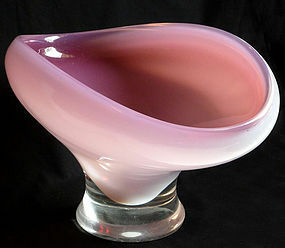 Also, added is a photo of the same piece in white, published in a renowned auction house catalog and listed as Venini. There is NO damage (chips, nicks, or fleabites). In EXCELLENT Condition!! 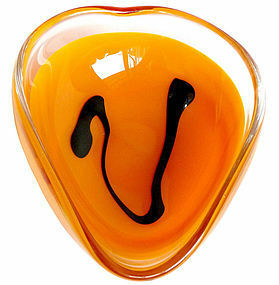 Incredible Murano Cased A Canne RAINBOW Filigrana Ribbons Art Glass Paperweight with MIRROR Surface!!! Documented to FRATELLI TOSO!!! It looks like a silver bullet or mercury glass when in person, as shiny as can be, and still the colors show through brightly. Very hard to photograph because of that. My photos do not do it any justice. There is NO damage (chips, nicks, or impact marks). In EXCELLENT Condition!!! 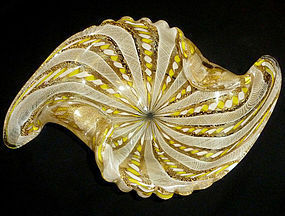 Striking Murano Cased White ZANFIRICO and YELLOW Latticino Ribbons over GOLD FLECKS Art Glass Bowl!!! 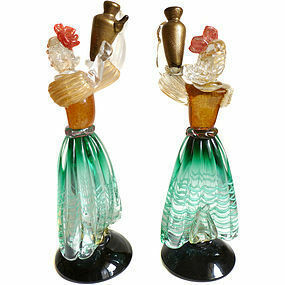 Attributed to Fratelli TOSO, circa 1950-60s!!! The piece has a scalloped edge. It is profusely covered in gold leaf, and glitters in any light. There is NO damage (chips, nicks, or impact marks). In EXCELLENT Condition!!! 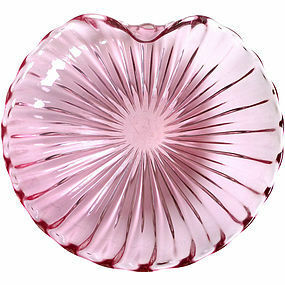 If interest in a larger piece and same shape, please look at stock# 4477. 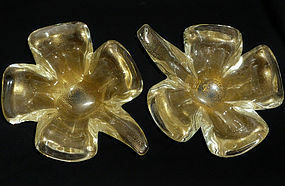 Gorgeous Pair of Early Murano Hand Blown White and GOLD FLECKS Art Glass Vases!!! 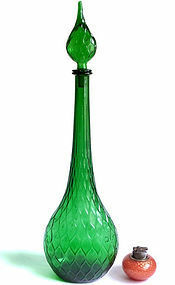 They date to 1935-1942, and 1 of them still retains its original label "ARS - FTB - Murano", for the FERRO TOSO BAROVIER Glass-Works!!! The pair is filled with gold leaf throughout, on the rim, handles and body. There is NO damage (chips, nicks or fleabites). In EXCELLENT Condition!!! 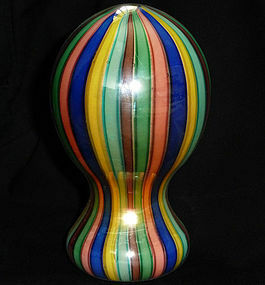 Gorgeous Antique Murano Hand Blown MILLEFIORI Flower Murrines Art Glass Cabinet Vase!!! Attributed to FRATELLI TOSO, circa 1910!!! 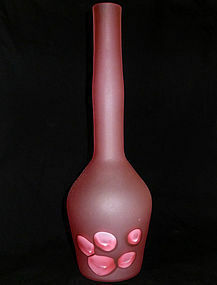 The piece has many unusual canes, including 8 Red Flowers with Stem (4 on the bottom), Harlequin, Bullseye, and many more. Every time you turn it, you have a new vase. Has NO damage (chips, nicks, impact marks or fleabites). In EXCELLENT Condition!! !